It is useful when you drop bolts etc. in the car engine room. This review is about item#35101787. It is very convenient for meter reading in dark places, when the numbers are not clear. I get handy things I want and it is very useful to improve the work efficiency. If you drop a bolt etc. at the time of maintenance etc. of a car, the hand does not reach. I am more solid than I expected and I am satisfied with that point. Just because the contact of the LED light is originally bad, there are times when it is bright, and it will light a little darkly. In that case, you have to loosen or tighten the screws each time. I want you to make the LED light part making more firmly. Magnet is more powerful than light I expected, so it is saved for work in dark places because it is lighted. I am satisfied very well with the quality of the product. It is convenient with a light attached, but it is easy to enter trash in the LED part and difficult to pick up. Convenient because the light is on. Maintenance work of the engine room etc. Since the LED light is on, it is saved when looking for bolts and nuts that fell into the engine room and picking them up. Although the magnet is powerful, the light power of the light is not good. 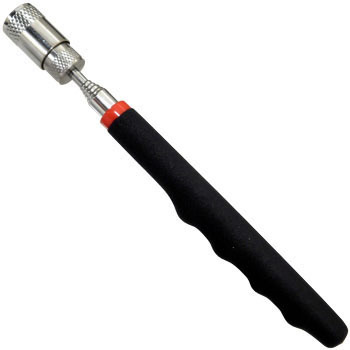 Although it is a screwdriving formula that tends to light the way of lighting, when this hand is moving in a work bag or a lap bag, there are times when it is loose and falling apart without knowing it. Also, it can not be used when the light stays on as it goes on. I think that it is better to switch to a switch type as problems arise. Gripping condition is good. It is better if the head pretends. It is much better if the hook or hole is empty beyond the grip where the head is too big. It is convenient because the tip glows quite brightly. I am worried about holding the battery. It is good that the LED is bright, but it is hard to use because it is thick for a narrow space such as an engine. I found it useful to find a dark place with a light. I did not get into the details because the head part became big. Used in pickup tools in a narrow place. There is texture, even at work in a narrow place the light at the tip is convenient without getting in the way.